I chose these two advertisements above because each represent qualities that show up the most when looking at beauty trends in China.From beauty products, to hair styles, China brings a lot of Western trends into their culture. However, how come certain trends translate while others do not? For instance, you see the huge desire for larger eyes in China. So much so that eyelid surgery is one of the most popular plastic surgery procedure in China. Why does that trend get picked up, while say, the Western obsession with self-tanner does not? These are the big questions that we were able to examine, review, and ultimately answer. “White Plus Renew” & “Lightening”: Both of these photos have the messages “lighting” and “white plus renew”. Both models display very pale almost white skin. The emphasizes on white skin dates back to when poor people would work in the fields and as a result get dark skin. Versus wealthier people who wouldn’t work would remain far skinned and pale. This “white” skin is a representation of high class and good social standing. This demonstrates the class differences and issues that exists in China. The Natural, Clean, Youthful Look: In both images, the advertisement highlights the female faces that look very youthful with almost no additional makeup on. This “natural” look is a significant trend in China and is clear in the majority of advertisements that you will see. The significance of having this trend present in both images is so that the consumer will purchase the product (why). In addition, that fact further proves that it is the ideal look for a Chinese woman to possess. It begs the question of how did this come to be? It could represent what men in China hope to see in their women. This is also a signficant difference between China and Western culture. Western culture’s advertisement’s usually consistent of models will very heavy makeup. It looks natural but its is articifical natural by using this product. These three connotations as well as their denotations demonstrate a whole lot about China’s ideal beauty. Furthermore, they show a lot about what the consumer is looking for and perhaps what male wants in a female’s looks. This entry was posted in Fashion and Gender in China on April 12, 2016 by kmullane. This photo shows hundreds of Red Guards united together at a Tiananmen Square rally in 1966. I selected this image for this week’s Mao Suit topic for a couple reasons. I felt like this photo combined a lot of unique qualities that several of the images we have seen in class. Another reason I chose this photo is because of the powerful message it eludes when you look at it first glance. When I first saw the photo, the mass amount of people in uniform created an extremely compelling feeling that forced me to examine it further. Focusing in on the denotations, there are three primary features of this image that stand out. The first being the photo of Mao which is posted behind the mass crowd of red guards. Clearly Mao is displayed high above the people, as a leader. He is clear that he is the person that these people are fighting for. However, there is only one small photo of him. 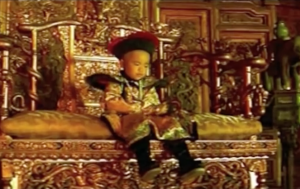 What also stood out to me about the photo of Mao is that it is very small and there is only one photo of him. This is extremely powerful, because it proved that Mao was represented in all aspects of these people, not just just the photo of him. Within the crowd of people, Mao is represented through the matching uniforms, the red books, and the expressions on these people’s faces. I would go even go further to say that the small individual photo of him hanging up would not even make a difference if it was not there. This is extremely significant because at this moment, Mao is so powerful that every aspect of this photo eludes him and is connected to his leadership in some way. The second significant denotation is Mao’s Little Red Book that is grasped tightly in every single person’s hand. With each person holding the books up high, they are able to be seen clearly by anyone there. The mass amounts of the color red also reiterates the dedication and fight behind Mao. Lastly, each person is wearing matching brown uniforms, which gives up a person’s individuality in exchange for the feeling of belonging. These matching uniforms play an extremely important role in Mao’s goals of utilizing young students in his fight for power and change. These matching uniforms demonstrate the feelings of unification and alliance that the youth needed at this time. The feeling of belonging and being needed for a cause is why most of these people joined in the fight for Mao. However, in reality, these matching uniforms allowed for no individuality or independence to be displayed. Instead, it was an army of people with the same identity and no opportunity to speak one’s mind. This clearly was an intentional move. What also stood out to me about the photo of Mao is that it is very small and there is only one photo of him. This is extremely powerful, because it proved that Mao was represented in all aspects of these people, not just just the photo of him. 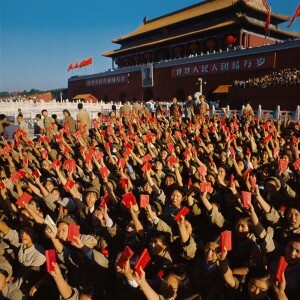 Within the crowd of people, Mao is represented through the matching uniforms, the red books, and the expressions on these people’s faces. I would go even go further to say that the small individual photo of him hanging up would not even make a difference if it was not there. This is extremely significant because at this moment, Mao is so powerful that every aspect of this photo eludes him and is connected to his leadership in some way. Overall, this photo has qualities that clearly stand out. However, it is the unification, dedication, and lack of individuality that are the biggest elements. Taking a quick glance at this photo, Mao Zedong’s control and power can be read through every aspect of this photo. This is a testament to his intelligence and ability to create a movement, whether it was a honorable movement or not is another question. This entry was posted in The Socialist - Mao suit on March 27, 2016 by kmullane. Moving forward with the topic of foot binding, we shift our focus to semiotics to dig deeper into the subject. Through a semiotic analysis, we can use our analytical skills to further understand foot binding on another level. start from here: This image is from the 2011 movie, Snow Flower and The Secret Fan, written by Lisa See. 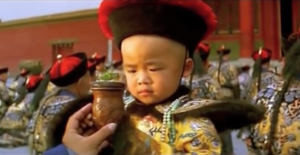 The movie was set in nineteenth century China and it focused on how women are victims of problems like foot binding. According to See, she wants her fans “to imagine how a few such women might have found voices of their own within, rather than in opposition to, the Confucian social order, and how they found ways to self-fulfillment without flouting their culture’s fundamental values.” (Lisa See, introductory note, Snow Flower and the Secret Fan. New York: Random House (2005) p 18) . In this image clip from the film, there is a man and a woman. The woman’s face is hidden in intricate headwear. Her foot, however, is the focal point of the image and is in the man’s hand. The foot is also is dramatically adorned, further cementing it’s importance. The environment of this image is primarily red. Both the man and the woman are wearing traditional outfits. All of this is taking place in a bedroom. The atmosphere of this photo is intimate and sexual between the man and the woman. When looking at this image, the female’s face is hidden, demonstrating its unimportance.The identity is insignificant compared to the success of the individual’s foot binding practice. In addition, the man gazing at the foot shows the cultural norm of the feet being sexualized. This image represents control that men have over women on a greater scale. Seeing women as objects, and focusing on the ‘beauty’ of their body parts emphasizes this control. Women are mutilating their body to become what men want. 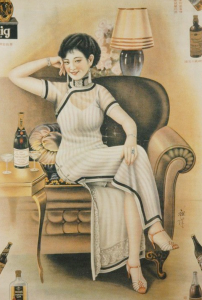 This image shows the control that men had over women in nineteenth century China. The ‘attractive’ women is one who has a small, delicate feet, that is only achieved through the torture and mutilation of oneself. Foot binding is a cultural expectation that women feel obligated to oblige by in order to have a future with a man. 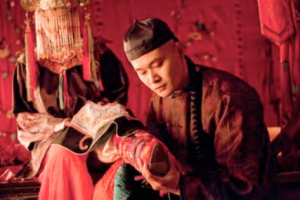 We can connect foot binding to traditions such as the wearing of corsets, which were worn in order to maintain and show off an hour glass figure for men. Or the idea of the lighter the skin the more wealthy it proved someone to be. If you were tanner, it meant you were working in the fields. Each of these traditions are somehow implemented into society’s expectations and are difficult to remove. This entry was posted in Fashion and Gender in China on February 15, 2016 by kmullane. Moving forward with the topic of foot binding, we shift our focus to semiotics to dig deeper into the subject. Through a semiotic analysis, we can use our analytical skills to further understand foot binding on another level. This image is from the 2011 movie, Snow Flower and The Secret Fan, written by Lisa See. The movie was set in nineteenth century China and it focused on how women are victims of problems like foot binding. According to See, she wants her fans “to imagine how a few such women might have found voices of their own within, rather than in opposition to, the Confucian social order, and how they found ways to self-fulfillment without flouting their culture’s fundamental values.” (Lisa See, introductory note, Snow Flower and the Secret Fan. New York: Random House (2005) p 18) . This image accurately demonstrates the control that men have over women.